Over 5 million civilians are struggling to obtain the most basic of necessities in and around Damascus amid the escalated fighting between the Syrian army and the rebels for control over a valley with the main regional water source. 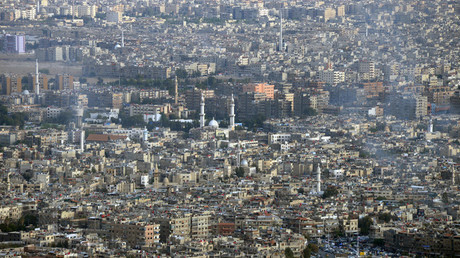 Residents of Damascus rely heavily on water from the Barada River. However, that water supply was cut in late December by the Damascus Water Authority, which said the source was contaminated with diesel fuel by militants. That cut has remained into the New Year, leaving more than 5 million people in a dire situation. Stores which once carried clean water are now left without so much as a single bottle, forcing civilians to go far from their homes to obtain water from a particular point in the city, RT’s Lizzie Phelan reports. "We come here for water and have to walk a long way to get home. When the water runs out, we come back here again," a Syrian woman told Phelan. 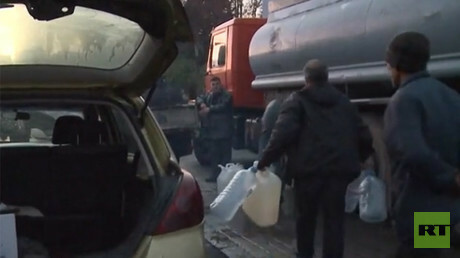 Around 700,000 people in the capital have not had water for more than 18 days, UNICEF told RT referring to its sources. 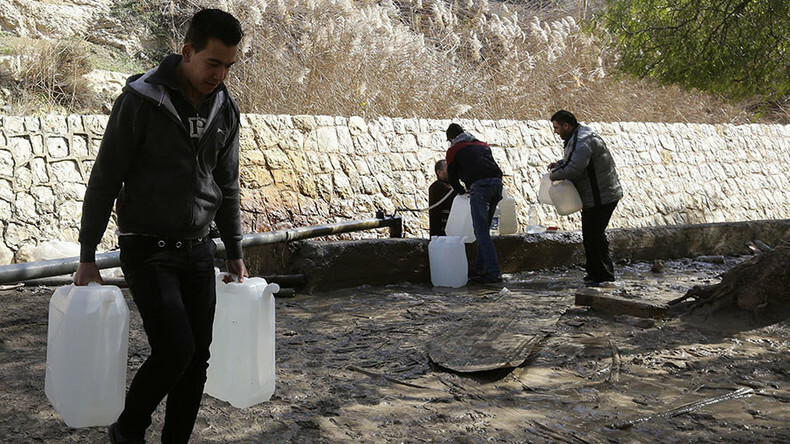 The organization added it was "extremely concerned that an estimated 5.5 million people in Damascus and its surrounding areas are cut off from running water for over two weeks." According to UNICEF, “most neighborhoods are getting water between 2 to 4 hours every three days through a rationing [program] initiated by local water authorities,” with people taking risks to collect water from mosques and public fountains, or buying it at double the price from private vendors with no safety guarantees. Meanwhile, locals explained to Phelan why they do not trust tap water, even when it’s available. “Everybody knows that the water up there [the river] is polluted with oil,” one resident told RT. Most people living in Damascus lost faith in the water coming out of their taps years ago, after rebels took control of the water supply. Phelan says they typically only use it for cleaning and sanitary purposes, but even that is now becoming a precious resource. Such conditions raise concerns about risks of water-borne diseases, especially amongst children, UNICEF said, adding that it is delivering water in trucks to schools. Together with other international aid organizations, including the World Health Organization (WHO), Oxfam and the International Committee of the Red Cross, they are working to help civilians in the water crisis by also providing additional generator sets, water storage tanks and technical assistance. As civilians struggle to obtain clean water, rebels controlling the source have laid blame on the Syrian government, claiming that its bombing campaign has damaged vital infrastructure. The Syrian government has accused the militants of contaminating the crucial reservoir as the rebels rejected a demand to leave the area. Rebels have previously been accused of repeatedly using the water source as leverage for their demands. “Water has been used as a weapon of war by all parties to the conflict in Syria,” UNICEF said in a statement to RT, calling on all parties to protect civilians and civilian infrastructure, including water infrastructure. Last week, UN's humanitarian adviser to Syria, Jan Egeland, said that "to sabotage and deny water is of course a war crime," as such actions mainly impact civilians. Meanwhile, humanitarian workers on the ground are struggling to help people who have difficulty accessing water. Essam Habal, a humanitarian worker with Saeed Society NGO, said they cannot take any sides or demand conditions when people are in need of urgent help. “As humanitarian workers, we cannot tie our assistance to conditions. We can’t have an agenda. Our goal must be purely humanitarian. It is not normal to put pressure on people by denying them basic necessities. Fuel belongs to the people, water belongs to the people. 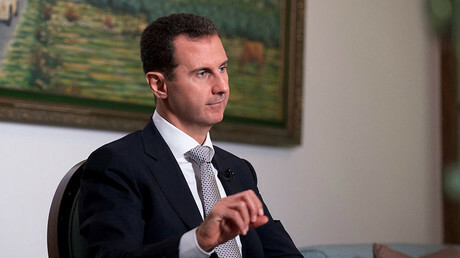 All the institutions, schools and so on, belong to the Syrian people – not to the government or any individual,” Habal told RT. He said he spends 18 hours a day delivering water from Damascus reserve supplies to those who have difficulty accessing it. The Syrian Arab Red Crescent has also received reports of water shortages in the area, its representative Mona Kurdy told RT. Its volunteers have delivered over a thousand cubic meters of water to Damascus hospitals, schools and refugee centers, she added.